During her inaugural address Monday, Gov. 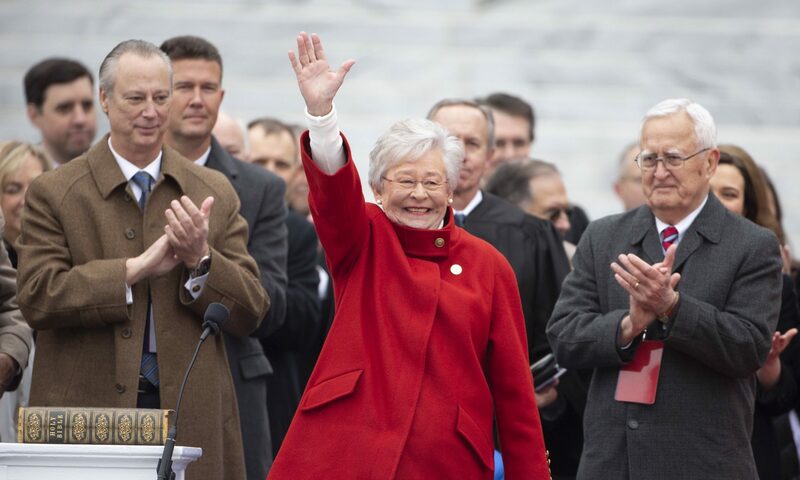 Kay Ivey, who is beginning her first full term as Alabama’s 54th governor, called on the Legislature to improve the state’s infrastructure and replace aging prisons. The governor was sworn into office Monday morning on the steps of the State Capitol. Ivey used the legacy of Gov. Lurleen Wallace, the state’s first female governor, to call for investments in roads and bridges. Though Ivey has a number of allies in the Legislature, where Republicans hold supermajorities in both chambers, the fight for greater funding for infrastructure — in the form of a gas tax — could be a difficult one. Republican leadership in both chambers have been in lockstep with Ivey on calling for an increase to the gasoline tax, which hasn’t been adjusted since 1992. Alabama’s Association of County Commissions and a number of business groups have thrown their support behind an increase in the gas tax. Despite that, significant numbers in the conservative wing of the Republican caucus have been opposed to efforts to increase the gas tax in recent years. Some Democrats have also opposed the increase, saying it would fall disproportionately on the backs of working Alabamians. In 2016, only South Carolina collected less in motor fuels taxes, but South Carolina will likely surpass Alabama in the next few years because it adopted a plan recently to gradually increase its gas tax, and its rate now exceeds Alabama’s. “After all, if we want to compete in a 21st-century global economy, we must improve our infrastructure by investing more in our roads, our bridges and our ports,” Ivey said Monday. Ivey never mentioned a gas tax specifically in her inaugural address, though. She stuck to general calls to increase road and bridge investment instead of speaking on a gas tax specifically. She has endorsed a modest increase in the gas tax. READ IVEY’S INAUGURAL ADDRESS HERE. Ivey seemed to predict that Republican leadership will need some help from Democrats to pass a gas tax increase. She called on legislators to work in a bipartisan fashion to solve issues. Lawmakers have tried numerous times in recent legislative sessions to move on a gas tax, but all efforts eventually stalled. This year, the gas tax seems to be a priority for leadership. Second on their list is prison construction — another issue that has remained at an impasse in the legislature for several years. Ivey called for an “Alabama solution” to problems with the state’s corrections system. Though few details have been publicly announced, the Department of Corrections has hinted a plan to lease new prisons. Less than two years ago, the Legislature rejected a plan by then-Gov. Robert Bentley to spend approximately $850 million on four mega-prisons. But prospects of securing funding for a smaller project with a higher price tag is sure to face push-back in the Legislature. Dunn’s appearance at this month’s Contract Review hearing was to receive approval for an extension to a nearly $11.5 million contract with Birmingham-based Hoar Program Management, LLC, to complete a study that would result in a request for proposal to build the three facilities. Could leasing be the answer to new state prisons? Two lawmakers who spoke with APR on background think that leasing prisons may not be the ideal solution, but it avoids much of the legislative in-fighting that doomed new prison construction in the past. The Legislature is set to convene in March for the 2019 legislative session.